1. Not in London. See above. 2. Not on the weekend. Too many people are not at work. 3. No anklebiters. Or at a stretch, one child of an age where snacks and restraining straps still work. Maximum. 4. Mental preparation for the inevitability of the ‘Temporarily Out of Stock’ sign posted on the warehouse shelf, when the only item that you actually went for just isn’t there. And possibly never was. 5. No $1 hotdogs. Or take a close-up look first. The Mr, two year old and I ventured midweek into the nearest superstore in search of an item which we have long agreed we could no longer ‘live’ without. Alas, alack, the item was unavailable. The day was saved by the accumulation of further revelationary, must-have, (and really must start sewing), contributions to the fabric stash. Heavy weight, cut-it-yourself, prints of goodness. And somewhat unpredictably, a moose. Note to self: Contemplate potential detrimental effect of large amount of time spent by kids’ with cardboard boxes/paper bags on heads. Ugh I hate going to Ikea. I follow the same rules (except for number one cos there's no chance I'll be in London)! 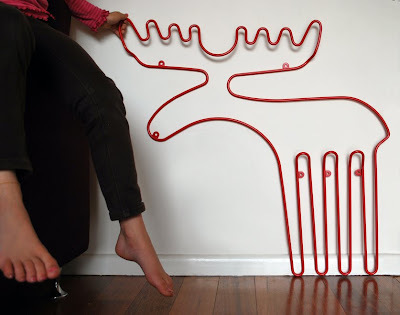 Is the moose an artpiece or does it have some amazing Ikea function? All Ikea paraphernalia should come with a written warning, sort of like alcohol. It sounds like fun, you think you need to it and you always feel terrible afterwards. And funnily enough, after some time has passed, you tell youself that it wasn't that bad and you put yourself through it again! Having said that, your fabric is gorgeous. My preferred Ikea time is Thursday evenings... although it usually means a small girl out after bedtime and eating bad dinners (ok - TWO small girls... one 30-something years older than the other). I reckon it's worth the pain to get Ikea fabrics. I'm going to blog a few more of my Ikea fabric creations tonight or tomorrow. Oh, gimme gimme. The ikea fabric, and the moose, and possibly the paper bag as well, as right now I'm hyperventilating out of desire for the fabric. 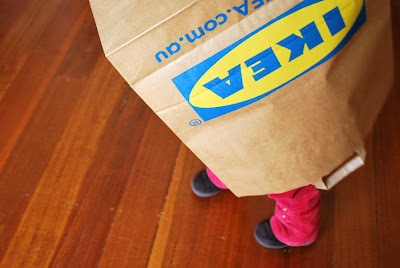 Everyone is making stuff out of ikea fabric these days... well, all the cool kids anyway. I love your fabric ! And I love the cut-it-yourselfness of the fabric counter . Apparently you can phone ahead to ascertain if the item you want is in stock ....but they won't put it to one side for you . So all you've done is throw Tantulus and a breathless ,undignified gallop to the stockroom into the mix . But , let's face it , knee-high moose(s) in a fetching shade of red are a must . - Love that moose ! I adore that heavy weight fabric. I live really close to an Ikea store. As in a 5 minutes walk close. And I would never, ever go there on a saturday. On saturdays, it seems like whole Germany and half of Holland empties in that particular Ikea. Not good. Really. Doesn't work. i love how ikea trips have similar themes for all of us! i also have a post ikea fabric stash and a collection of unexpected peculiars that i haven't quite got around to using yet! I love getting fabric at IKEA because you get to cut it yourself. Makes me feel all grown up and professional. LOL Cherrie PS I'm from the country and have only been a couple of times which is probably all for the best because I don't think I could afford to live nearer. "Don't keep telling me what you DON'T like and start telling me what you DO like. And then let's just bloody get it!" I think one of the reasons I have a happy marriage is becasue the nearest IKEA is 500kms away. Seriously how many couples break up after a visit!!!???! How many couples do you see with the major s*its with each other?? They should have couples counselling in the section where you have to pick up your own stuff. love the fabric and the moose. in the place where I life we have the famous IKEA obstruction on the motorway on weekends. so even if you don't need to go to ikea you have to stand in line with your car because the whole highway is obstructed at the height of the side-way to ikea. If, I say IF, we go there we go by bike on a Wednesday morning. But most of the time we just don't go there. Also because the times I went there I get tempted to buy somethig I really really really do not need. Oh yes the Ikea madhouse I know the feeling too..
Love your fabric and moose...Gotta love the quirky things you end up coming home with. The only good thing about going to IKEA in london was that you could only purchase as much as you could carry on the stupid tram. I can't seem to get out of that place without spending at least $300! Love your fabric pics Tania. We went on the weekend too (freaky) and I gazed longingly at the fabric but had to keep walking as the child was about to have a melt down. And yeah, know what you mean about IKEA in London, we were horrible (and repeatedly... what were we thinking) scarred by the Croydon store. Fantastic prints and always worth the hellish experience. Mr Moose is pretty cute too! 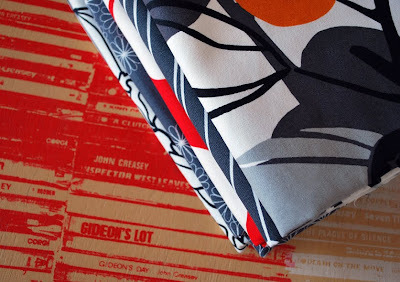 I'm huge fan of Ikea fabric, so I brave the maddness everynowandagain, just to stock up! Loving the new range! Love, love, love Ikea fabric - your acquisitions are fabulous. I have worked out a secret way to duck and weave through stands, partitions and teeny tiny flat packed kitchens to get to the upholestry more quickly. PS. We take your Ikea paper bag and raise you an Australian Post Tuff Bag. Thanks, NOW you're telling me to take a close-up look at the $1 hotdogs... does it have anything to do with the moose? Oh Ikea...The amazing store that means that I can find my brother and brother in law one in France the other in England and we have the same drawer or shelves...Isn'it something INCREDIBLE!! !And I realsise I have the same red and white fabric I think;))But we keep going back for more as some people point out! Wow! the trip would have been worth it just to own that moose. I'm getting close to 60 so the chances of shopping with a 2yo....or at least one I'm allowed to smack... are remote. I love IKEA, where else to you get to buy unexpected, unnecessary things which will remain unused but give you so much pleasure...oh that's right the quilt fabric shop, of course. if you ever brave the second trip and feel inclined to snip some extra fabric for the ikea-less across the straight let me know - with my money of course! that would be across the strait! I'm on a roll...the last post's word verification was 'typture'....so apt when typing one-handed while breast feeding babe parked across ones lap!